The Nearings represent a unique and timely piece of Maine history that is not often taught. However, in our unsustainable and violent society, Helen and Scott’s principles of simple and purposeful living remain as crucial as ever. At The Good Life Center we continue to attempt to live a lifestyle in harmony with the earth and with a strong commitment to social justice. Like the Nearings, we find value and meaning in good hard work and love to share its rewards. The program is designed for camps, elementary, high school, and college students, as well as adult ed. We are willing to work with teachers or facilitators of younger groups. We invite groups for a day, or even an overnight to truly experience life on the homestead. (We usually begin with an introduction to the Nearing¹s philosophy and lives, tour the gardens and house, show an optional film, and have a work party.) The Nearings understood that learning happens by doing. 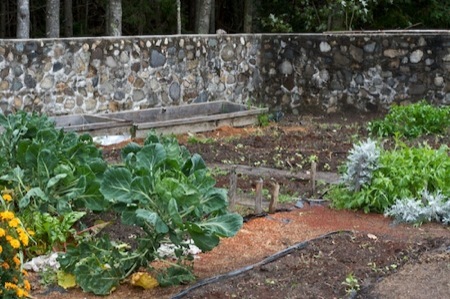 Jobs are seasonal but include gardening, weeding, compost making, seaweed collection, wood stacking, etc. This is an incredible opportunity for young people to experience another way of living, that is often not presented as an option to them. It always inspires much self reflection and good discussion. Usually, the groups will arrive early in the day and have a talk and a tour with the Resident Stewards. Lunch is followed by service work around the homestead. Its always amazing how a crew of people working for the fun of it can get so much done. One Outward Bound group stacked the year’s wood! Another group cleared a spot for some trees, then stayed through the evening for a Monday Night Meeting with artist Robert Shetterly. Groups from Colby, Bowdoin, College of the Atlantic, The Chewonki Institute and Hidden Valley Camp have all come and helped out with weeding, mowing,clearing out around the yurts, among other projects. Of course, the we are grateful for all the work that gets done! But the stewards also get a lot out of being around so many enthusiastic and interested young people. And the campers, sailors and college students are able to become part of Forest Farm by giving of their labor. We hope that they will take a little of the spirit of the place and the people who built it out in to the world. These comments were written in the guest book at the Nearing Good Life Center, the historic homestead of the late Helen and Scott Nearing, by high school aged students visiting the Center while on a trip with the Hurricane Island Outward Bound Program. The teenagers visited the Center over the summer and participated in a community service project, as well as a tour of the homestead. We would like to extend an invitation for your students or group to visit the Nearing Good Life Center. There is no charge for the visit. This field trip experience would integrate well with your Outdoor Ed., Community Service, Social Studies, Science, and History curricula in terms of the 20th century political and social history of the United States and Maine, the study of the environmental and agrarian movements in the United States, and local Hancock County history. Visitors would enjoy a tour of the historic organic garden, compost heaps, and greenhouse, and the famous stone building and could also view a documentary video, take a short hike, pick apples and participate in a discussion of the importance of the Nearings’ lives and writings. Visitors can bring a lunch and eat on the beach by our beautiful cove or in our hand built wooden yurt. If interested, please notify the Farm Manager (Warren Berkowitz, 207-374-5386, wberks@myfairpoint.net) to plan your visit to Forest Farm.